UPDATE 1630 GMT: The Deir Ez Zor Coordination Committees say that Islamic State fighters have entered the towns of Mayadin and Ishara in eastern Syria after insurgents withdrew from the area. The Islamic State also claims that it has captured the Omar oilfield, one of Syria’s largest. Insurgent factions in northern and eastern Syria, fighting both the Assad regime and the Islamic State, have issued an ultimatum to their military and political leaders. The groups, locked in battle with the Islamic State since January, said they were running short of weapons and ammunition. We, the leaders of the brigades and battalions…give the National Coalition, the interim government, the Supreme Military Council and all the leading bodies of the Syrian revolution a week to send reinforcements and complete aid. Should our call not be heard, we will lay down our weapons and pull out our fighters. Insurgents in northwestern Syria have pushed the Islamic State out of most areas. However, the Iraqi-led group holds Raqqa, the largest city outside regime control, in north-central Syria, and it has pressed the insurgency with the capture of towns and villages in the east. The Islamic State is now threatening to move into Deir Ez Zor city, where insurgents are also trying to fend off President Assad’s forces. The Syrian National Coalition has been appealing to the US to step up military assistance, with its head Ahmed Jarba meeting US Secretary of State John Kerry in Saudi Arabia last week. So far, the appeal has had only token success, with President Obama saying that he would ask Congress to authorize $500 million in aid. Both pro-regime and pro-opposition outlets say Syrian forces moved into the Sheikh Najjar industrial area near Aleppo on Thursday. The area was exposed to more than 20 air raids this morning, which coincided with the regime gaining control of wide parts of the industrial city, especially industrial area 3. They are now moving to gain control of the entire industrial city. The regime has tried for months to seize the industrial area, home to several factories. 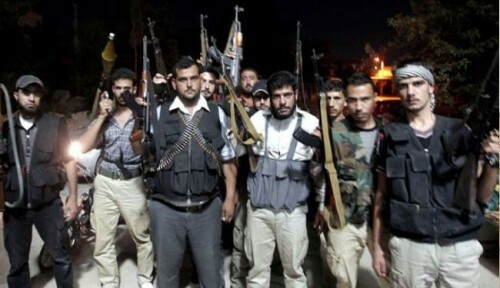 Its capture would also further the Syrian military’s goal of cutting off insurgents in the eastern half of Aleppo city. Is Obama Administration Considering Alliance with Assad? Anyone calling for regime change in Syria is frankly blind to the past decade; and the collapse of eastern Syria, and growth of Jihadistan, leading to 30 to 50 suicide attacks a month in Iraq. Residents in Raqqa in northern Syria say the Islamic State, which controls the city, is cutting daytime electricity during the holy month of Ramadan. The Islamic State is reportedly imposing the ban to follow the example of the Prophet Mohammad, who lived 1,400 years ago. Residents say entertainment like internet and television are important to cope with 13-hour fasts in the heat of summer, and air conditioning is vital for groups like the elderly. Ramadan began on Sunday and lasts until July 28. Rumors are circulating of further clashes after insurgents evicted a group of Islamic State fighters from Midaa, a town in the East Ghouta area near Damascus. Al Manar, linked to Hezbollah, claims the Islamic Front’s military commander Zahran Alloush was severely injured in shelling by the Islamic State. Last week Al Manar declared that scores of Alloush supporters were killed and wounded in a suicide bombing by the Iraqi-led group. Human Rights Watch, profiling 17 Syrian women who are now refugees in Turkey, highlights detention and abuse by regime forces. The 47-page report, “We Are Still Here: Women on the Front Line of Syria’s Conflict”, also claims violations by the Islamic State and by insurgent factions such as Liwa al-Islam. Activists and humanitarian aid providers said they had been threatened, arbitrarily arrested and detained, and tortured. All six former detainees who are profiled have experienced physical abuse or torture in detention; one woman was sexually assaulted multiple times. NextIran Daily, July 3: Nuclear Talks Resume in Vienna — But Will There Be an Agreement?